This season I decided to dump the neutral look that I have been using for like forever now. Instead I am just going straight for what excites me and brings me joy as well as matches the feel of Christmas for me. Christmas brings on a a sense of excitement and wonder coupled with joy and cozy nights indoors. And these same feelings are ones I would like to share with my children during their childhood and what I would like for them to have memories of. I decided to get over my fear of nothing matching (which is easy avoid with a nuetral pallet) and sticking to a fun and specific color pallet to ground the feeling that I want to portray during this season. 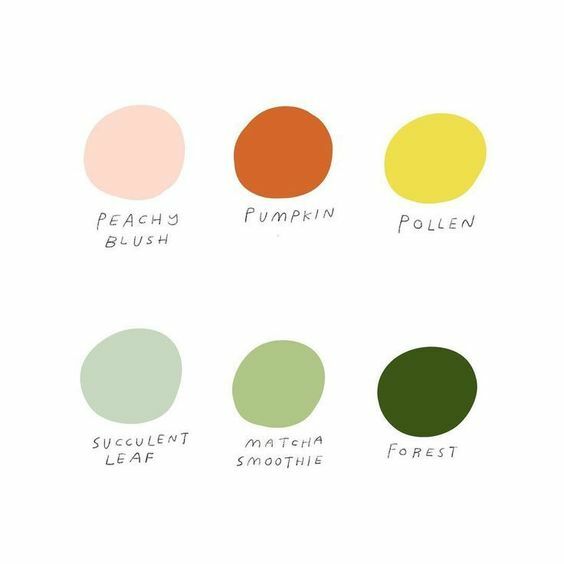 My theory is that if I stick to a color pallet that I love (and am totally obsessed with) not only can these colors work for Christmas but I can use this idea throughout my home for any season and any time of year! By sticking to a specific color scheme and swapping colors (or even adding these color when I could) rather than items it would be less wasteful and a more natural transition using mostly items that I already have. One thing I decided to swap were these adorable DIY Christmas Stockings. I used fabric that I already had on hand and swapped them with a couple of tired looking ones I bought a few years prior. The green one in the pics below were literally falling apart at the seam after being washed 1 time. Not only do I absolutely love the stockings I made because of how much they brighten up the fireplace, but I know they are well made and will last a long time. I can find the exact color pallet I am looking for but this fun and pretty one by Worthwhile Paper is pretty stinking close and adorable! I somehow have lost my ruler so I used a measuring tape, but ideally a flat ruler is preferable for this project. Also, some sort of a snack is a must. Ya know, in case you get famished along the way or need a little encouragement. And I didn’t end up using this combo together but it’s so stinking cute right? Lemon fabric is Art Gallery Sage Jersey Knit Yuma Lemons Mist Fabric and the plaid is Art Gallery Day Trip Summer Picnic Plaid Fabric. First set up your printable if you aren’t using an older stocking to trace. 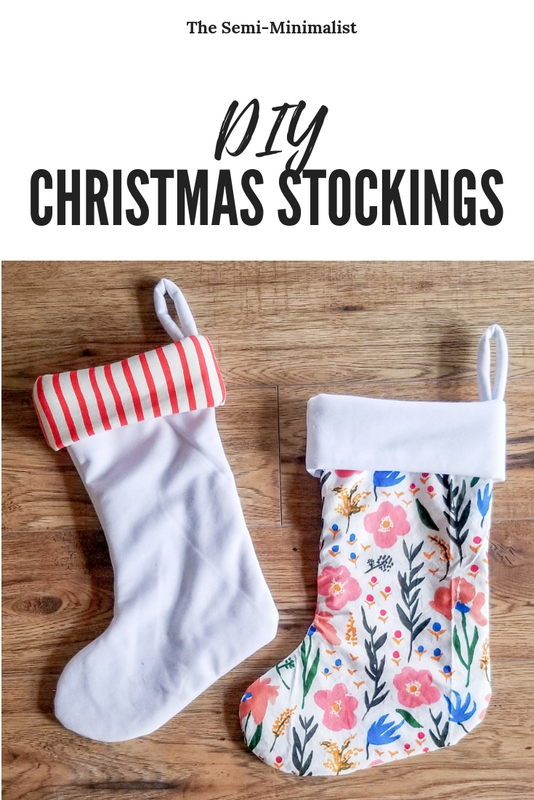 With this printable you can print it out twice for your two layers of stocking or you can print it once, cut the larger pieces first, then cut out the smaller stocking and cut out the smaller pieces. Basically you will have four main stocking pieces that you will make from this pattern. Two mirror images of the outer shell and two mirror images of the inner shell. The outer shell is slightly bigger so it will fit around the inner shell nicely. This is especially important if one layer if a bulkier fabric like the fleece that I used. Once set up the printable should look like this. The printable I have attached for you guys may or may not have the extra writing on it depending if I get around to uploading the new version or not…But if it doesn’t you can also refer to this picture. Once your printable is set up then you will cut two mirror images of the outer shell and two mirror images of the inner shell. 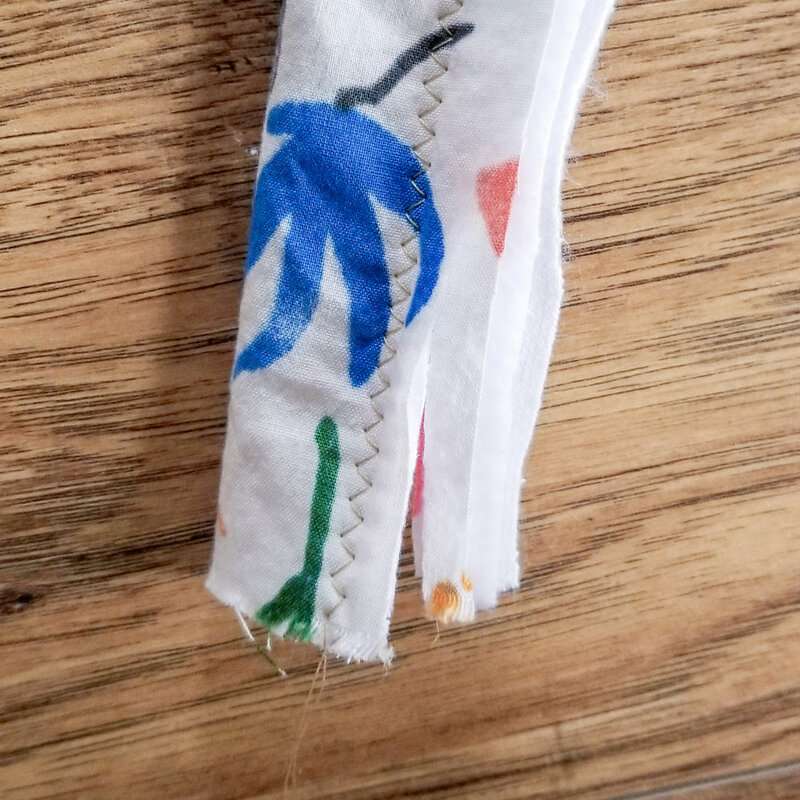 This is accomplished by folding the fabric in half, tracing the pattern onto the fabric, and cutting through two layers of the fabric at the same time. If your fabric slides at all pin the fabric together to avoid shifting during the cutting process. This ensures that all pieces will be correct and match each other. It should look like this. Corners are lifted in the picture to show you will be cutting through two layers; although it’s hard to see. Just make sure that either the right sides are together or the wrong sides together so that the pieces are mirrored. Also cut the other pieces using the measurements above. Total you should have 2 inner stocking mirrored pieces, 2 outer stocking mirrored pieces, the cuff piece, and the strap piece. Set your sewing machine to zig-zag stitch, 2.5 stitch width, and 2.5 stitch length. This is what I set for my machine but you could also test what works best for the fabrics that you are using. After all of the pieces are cut out you can start sewing. First, pin together the outer shell pieces. Then pin together the inner shell pieces. Sew the inner shell right sides together with 3/8 inch seam allowance. Then sew the outer shell right sides together with 1/2 inch seam allowance. You can then sew the cuff piece together by folding it long ways with the right side together and sew the height of the cuff. Also sew the strap with right sides together and 1/2 inch seam allowance. All the pieces sewn together should look like this. In this pic the outer shell is already turn right side in. The inner shell will be left “right side out” when it is placed into the outer shell. I have already trimmed the cuff in the picture but also trim the strap. It will make it much easier to turn right side in if you do. I didn’t really trim the excess on my stocking shells but if the curves of the heel and toes are looking a bit funny it would probably be a good idea to do so. Once trimmed turn inside out using a safety pin. Put aside. Ok, now lets insert the inner shell into the outer shell with this handy GIF. Then I made sure to pin the inner and outer shell in place so I could work on the cuff without worrying about it shifted around. I also folded the cuff in half so that it made a circle and I pinned it inside of the sock with all of the raw edges pinned together. That would make the folded portion facing towards the heel or toes (if that is any less confusing). You can barely see it but the cuff should be inside both the inner and outer layers of the stocking. Also see below for how to insert the loop before moving forward. I sewed the cuff to the top of the stocking (including inner and outer shell) and I sewed around the entire edge of the stocking. It should look like this. Once you pull the cuff out it should look like this. Only with the loop. And your done! Yay! If you have any treats left pop one in your mouth and admire your work. Below is the before and after of stockings. The after is much better I think. So what do you think? Really, the before is cute but I am in love with the after. And since I am obsessed with Pom Pom making I added some to the fur stocking as well! I really love how these came out. And I really love not worrying about them falling apart if they need to be washed in the future! I would love to know if you all tried making one of these for yourself! Tag #TSMstocking (TSM short for The Semi-Minimalist) on Instagram and I will be sure to share!